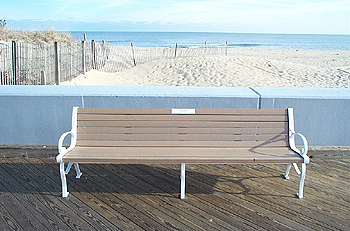 The Town of Ocean City, MD began its Bench Dedication Program in 2004. In 2016 we placed the last order of new benches on the boardwalk adding to the grand total of nearly 1,000 benches. At this time there are no plans by the City in purchasing any additional benches or expanding the program any further. Each bench owner has several options at the end of their term (the term is 10 years- which is how long we estimate the bench will last before having to restore). They can pay to restore their bench remaining in the program at their current place of choice. They can take their bench with them, putting it in their backyard/front porch. They can donate it back to the Town of Ocean City, which we will then take possession of it, have it broken down and completely restored to new condition. The bench would then become available to someone who is currently on our wait list. As explained in the above section #3, when a bench is donated (we only get on average about 5-7 benches a year) those people who have submitted their information will then be contacted to see if they’re interested in that location. It all depends on the location of the bench that has been donated by the owner and those who are waiting on that location before you. CAN I PUT THE BENCH ANYWHERE ON THE BOARDWALK? No. Unfortunately we have a limited number of benches that become available and those benches will eventually go back to that original location. If there’s someone interested in that location, then we will reach out to them to see if they’re still interested in joining the program and becoming an owner. Cost of owning a bench is $2,500. The bench comes with a 10 year term under which, at the time you sign your agreement with the City, we agree to maintain and upkeep the bench during this time. This means replacing slats when they become cracked, peeling paint, unusual wear, scratches etc… As you know and are aware- nothing lasts forever especially here at the beach. Salt water, Sand, Wind, Humidity, Hurricanes & Nor’easters, and visitor wear and tear – all play a part on how the bench will age.